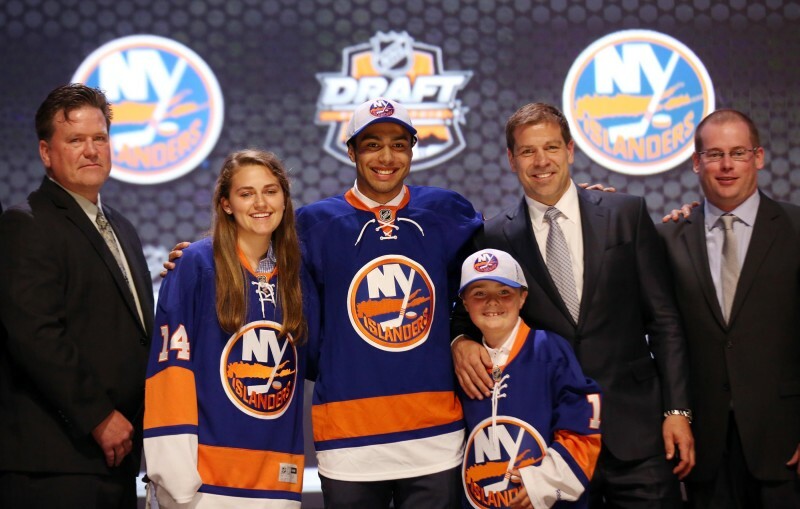 With the 2014 NHL Entry Draft finished, New York Islanders fans were definitely treated to some drama, suspense, and interesting decisions on both days of the draft proceedings. When all was said and done, it seemed as though Islanders fans were more or less pleased with the way that Garth Snow maneuvered a draft class that was regarded as being especially thin. Despite the fact that the Islanders’ intentions with the fifth overall pick were up in the air, the Isles’ first round selections might have pleasantly surprised those that might have been expecting the team to deal the pick. While Garth Snow did deal two picks in order to draft once again in the first round, there was certainly no shortage of action for Islanders fans that were patiently waiting to see what their beloved team would do before a long hockey layoff. Give the pick to Buffalo? Trade the pick away? Keep the pick? These were just some of the questions that Islanders fans were asking themselves and fellow diehards leading up to the 2014 NHL Entry Draft. After refusing to send the pick to Buffalo, and after speculation of what the Islanders would actually do with their fifth overall selection, General Manager Garth Snow decided to restock his draft pool – and started by drafting a pivot, Michael Dal Colle. Snow is no stranger to drafting players out of the OHL, and with a solid two-way game Dal Colle made perfect sense for New York at number five. 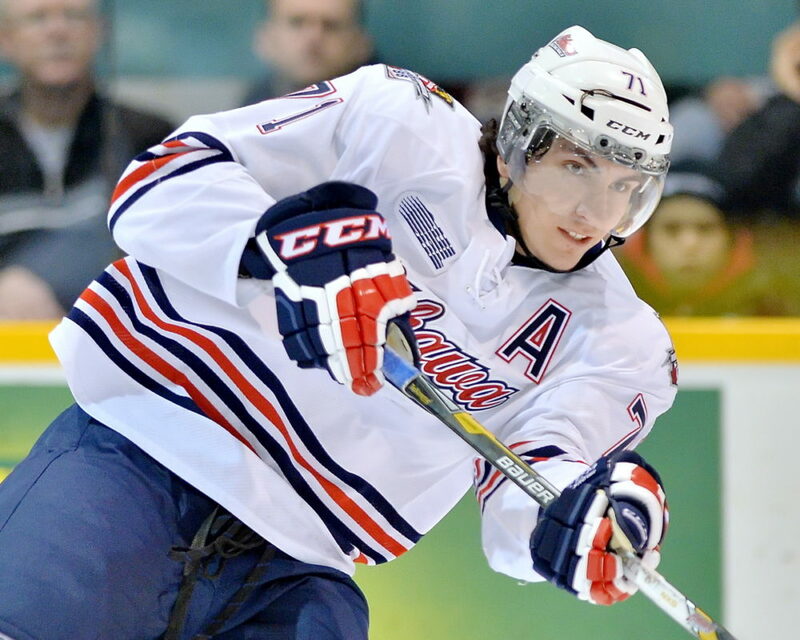 In his second season with the Generals, Dal Colle nearly doubled his point totals as he went from 48 points (63 GP, 15G, 33A) to 95 points (67GP, 39G, 56A) scored, but his grit and ability to utilize his 6′ 1.5″ body frame in physical situations undoubtedly appealed to Snow. While Dal Colle is a top prospect that will provide the Islanders with some offensive depth in their prospect pipeline, he probably won’t be ready to contribute at the NHL level for another few years at the very least. Going defense-heavy over the last two NHL drafts, Dal Colle was a logical pick for the Islanders – both in terms of replenishing offensive depth in the pipeline and selecting the best player available at number five. Islanders fans probably weren’t expecting their team to trade back into the first round, but Garth Snow shocked a considerable amount of fans when he traded up to eventually land Joshua Ho-Sang with the 28th overall pick of the draft. With Ho-Sang on a number of “Do Not Draft” lists for a variety of NHL teams, the move was met with immediate scrutiny, and rightfully so, but it is not a move that does not have its merits. Of course, Ho-Sang has made waves with NHL teams as he has been viewed as a controversial player that has “trouble” respecting authority. Try as we may to understand Ho-Sang’s mentality, there is no doubting that the forward is an intelligent, and straightforward, individual. Whether or not Ho-Sang will be an integral piece of the New York Islanders a few years down the line is anyone’s best guess, but his talent is undeniable, and he was simply too good to let slip so late in the draft. Questions have been abound as to Ho-Sang’s defensive play, but much like Dal Colle, Ho-Sang demonstrated tremendous growth in his second season with the Spitfires as he scored 85 points (67 GP, 32G, 53A) – nearly doubling his 44 points (63 GP, 14G, 30A) scored during the ’12-’13 OHL season. Hindsight is always 20/20, and there is no chance of knowing if Ho-Sang would’ve been available for New York during their second-round selection, but what is known is the fact that Garth Snow has the utmost confidence in an individual that everyone was writing off based on his perceived character and personality. Only time will tell if Ho-Sang can transcend his offensive talents to the NHL, but for now he definitely has the support and backing of the Islanders’ front office – and it could very well wind up paying off enormous dividends in the long run. With the 78th overall pick, the Islanders decided to start restocking their goalies. After the departure of Anders Nilsson to the KHL, and with Kevin Poulin likely not being re-signed by the team, it only made sense to draft Ilya Sorokin as the goalie is already playing KHL hockey with Metallurg Novokuznetsk. In his first season of extended play in the KHL, Sorokin played in 27 games and compiled a 2.90 GAA and .911 Save Percentage. Although the aforementioned numbers might not stand out to some hockey fans, the important thing to remember with Sorokin is that the 18 year old netminder only played in five KHL games during the ’12-’13 hockey season before appearing in 27 KHL contests this past season. Isles add Russian prospect Ilya Sorokin, who already has close to 40 games of KHL experience with Metallurg as an 18-year-old. Sorokin will most likely continue his growth in the KHL – hopefully in the same mold as other Russian goaltenders such as Andrei Vasilevski – for the next few seasons as the Islanders have Stephon Williams, Parker Milner, and Eamon McAdam all waiting in the wings to prove themselves at either the AHL or ECHL level. Having shown steady progression in the MHL and KHL over the last two seasons, Sorokin will definitely be an interesting prospect to monitor over the next few years as he continues to develop in one of Europe’s most competitive ice hockey leagues. Seventeen picks after drafting Sorokin, New York went right back to addressing goaltending depth as the team chose Linus Soderstrom. Out of all of the available international netminders, Soderstrom was the third tallest (6′ 3.5″) out of the bunch and was actually ranked three spots higher on CSS’s final international goalie rankings than Sorokin. Regardless of his overall ranking, Soderstrom has progressed through the Swedish developmental leagues in steady fashion. Going from the J18 Allsvenskan to the SuperElit league this season, Soderstrom displayed no ill effects when transitioning to a new league as he registered a 2.61 GAA and .915 Save Percentage in 23 games played in the J20 league. Soderstrom seems to be slated to start the ’14-’15 hockey season playing in the SuperElit league, but there is a good chance that he could see a considerable amount of time in the SHL as well. Much like Sorokin, Soderstrom’s arrival to North America probably won’t happen for another few years, but if the goalie’s development thus far is any indicator of his potential abilities, then the Isles could have some tough decisions to make in terms of their goaltending depth in a few seasons. Devon Toews was the only defenseman selected by the New York Islanders during the 2014 NHL Draft, and with the pipeline stocked with defensive prospects it’ll be interesting to see what kind of player Toews develops into as he continues playing at Quinnipiac University. As a late-blooming player – Toews had a late growth spurt – the defenseman’s physical make-up (5′ 11″, 174 lbs.) is reminiscent of Aaron Ness, and his skating and puck-moving abilities have also been highly touted. While a member of the Surrey Eagles, Toews recorded 76 points (17 Goals, 59 Assists) in 102 BCHL games, and even had a couple of fairly productive postseasons with his Junior A team. Continuing his progression in the NCAA this past season, Toews put up 17 points (1 Goal, 16 Assists, +10) in 37 games played for Quinnipiac during his rookie campaign. It is particularly hard to tell where Toews will fit in the organizational depth chart since New York has a good amount of defensemen being groomed for NHL duties, but another couple of seasons in the NCAA or ECHL might provide fans with a better idea of what the defender can potentially bring to the table. With the 155th selection of the 2014 Draft, Garth Snow selected Kyle Schempp from Ferris State University. During his rookie season, Schempp tallied 25 points (10 G, 15 A, +10) in 43 games played, and should see some added responsibilities as he goes into his sophomore season in the NCAA. Much like Toews, Schempp is an over-ager as he is 20 years old, and he will likely need to play at least another season of college hockey before there is room for him at either the ECHL or AHL level. With the Bulldogs finishing with the number six overall ranking, and coming within a game of the Frozen Four, Schempp’s should play a key part on his hockey team this season as he was used in a variety of situations last year – ranging from even-strength duties to those on the penalty kill and power-play. Not only was Schempp utilized in a variety of ways, he also displayed a propensity to play a two-way type of game – something that likely appealed to the Islanders. Playing with a torn labrum last season, Schempp won’t participate in rookie camp for New York, but he should be ready for the start of his upcoming NCAA season. The son of Rich Sutter, and the last of the three over-agers picked by the Islanders, Lukas Sutter might come across as just another bruiser/sin-bin character based on his PIM totals over the last four years in the WHL. Re-entering the draft much in the same way that former Islanders prospect Brenden Kichton (re-drafted by Winnipeg Jets in seventh round) did in 2013, Sutter was chosen with the Isles’ last pick of the 2014 NHL Draft. Similar to Schempp, Sutter plays a two-way game and is no stranger to playing a physical brand of hockey. With reconstructive shoulder surgery having cut his ’13-’14 WHL season short, Sutter only appeared in 45 games for the Red Deer Rebels. Sutter’s decline in production over the last two WHL seasons has been plain to see for anyone, but hopefully a change of organizations could alleviate some of the expectations that may have been placed on Sutter as a second-round pick in the Jets’ organization. With a 3.1 overall GPA, the New York Islanders finished the 2014 NHL Entry Draft with a B-average – which is certainly not bad at all considering the fact that this draft class has been viewed as especially thin. Drafting the likes of Dal Colle and Ho-Sang in the first round was a solid choice by Islanders’ General Manager Garth Snow, and the two aforementioned forwards should be ready to contribute in New York’s pipeline sooner rather than later. Spending two picks on two goalies during the middle rounds ultimately refilled the Isles’ prospect pool with goaltenders and will add to the youth and depth (Milner, Williams, McAdam) that New York previously had at the position. Even though Snow’s last three picks were used on over-age players, they all embody the hard-working and gritty style that the Isles’ GM has been trying to build the Islanders around. Whether or not some or all of these prospects pan out is anyone’s best guess at this point in time, but for a draft that everyone was seemingly shying away from from the outset, it sure seems as though the Islanders made some interesting selections that could pan out and help in some way, shape, or form down the line.